Shonumi Wrote: Not true. All it proves is that the current implementation of HLE audio in Dolphin isn't yet as accurate as LLE. That's not the same as saying HLE audio will never be as accurate as LLE audio. You saying that HLE can be as accurate as LLE is making me question your knowledge on emulation. HLE will never be as accurate as LLE. Shonumi Wrote: You keep assuming LLE is the only way without ever demonstrating that LLE is the only way. I have demonstrated that LLE is more accurate then HLE, by pointing out that no HLE SNES emulator can render Air Strike Patrol properly. Until someone makes a HLE emulator that can render Air Strike Patrol properly, you are wrong. Shonumi Wrote: What's the point in asking me to emulate a CPU or a GPU with 100% accuracy if emulation is never 100% accurate? Emulating a CPU or GPU with LLE with 100% accuracy is just as impossible. Additionally, the DSP-1 and DSP-2 co-processors in the SNES could largely be emulated via HLE with near bit-perfect accuracy. Exactly my point HLE fanboy, you can't emulate anything with 100% accuracy like you stated, even if its only the BIOS like you claimed. Although, LLE will always be more accurate then HLE. Shonumi Wrote: When I say upscaling is interpolation, I mean upscaling is interpolation. When I say upscaling isn't interpolation, I mean upscaling isn't interpolation. If I can use interpolation on a texture without the need to upscale it, then upscaling is not interpolation. You saying this makes you look very ignorant. Shonumi Wrote: Pretty sure, but can't provide an ounce of evidence? If the link RachelB posted has examples of HLE for the CPU code, can you point it out? If not, can you explain in detail how SNES9x uses HLE for the CPU, or find someone else who can? Shonumi Wrote: Furthermore, why would I need evidence to prove HLE can emulate Air Strike Patrol correctly? Because HLE is the reason there is no shadow in Air Strike Patrol. HLE is being used to emulate the PPU with other emulators, which is why there is no shadow in the first place. Shonumi Wrote: A true LLE emulator has no enhancements. No save sates, no fullscreen, no nothing. I wouldn't consider those enhancements, as much as options. There is no way a true LLE emulator can increase internal resolution, and until you or someone else does it, you are wrong. Find a better source please. You must of had to dig pretty deep to have to find a website that claims upscaling is interpolation if its in a different language. Which makes sense, because when I googled it, I couldn't find a legit source that claimed upscaling is interpolation. When you upscale an image, it almost always uses Nearest-neighbor interpolation, not its own special interpolation method like you claim. Shonumi Wrote: Here is the current CPU implementation of Mupen64Plus. It looks extensively LLE'd to me, especially when you look at individual instructions in the interpreter files. Mupen64Plus is based off of Mupen64, which is a HLE emulator. Just because an emulator uses LLE interpreters, doesn't make it a full blown LLE emulator like you claim. Quote: Mupen64Plus is based off of Mupen64, which is a HLE emulator. Just because an emulator uses LLE interpreters, doesn't make it a full blown LLE emulator like you claim. No one ever claimed it mupen was an LLE emulator. Howerver it does LLE the cpu. Quote: I have demonstrated that LLE is more accurate then HLE, by pointing out that no HLE SNES emulator can render Air Strike Patrol properly. Until someone makes a HLE emulator that can render Air Strike Patrol properly, you are wrong. The only thing you have demostrated is that bsnes is more accurate than any other snes emulator. That it is an LLE emulator means nothing. (07-10-2013, 05:32 AM)RachelB Wrote: No one ever claimed it mupen was an LLE emulator. Howerver it does LLE the cpu. But if the LLE interpreter is being used by an HLE emulator, then it isn't fully LLEing the CPU. The emulator itself must be LLE for it to be fully LLEing the emulator like MESS does. MESS is the only emulator to fully utilize LLE on all parts of the N64. (07-10-2013, 05:32 AM)RachelB Wrote: The only thing you have demostrated is that bsnes is more accurate than any other snes emulator. That it is an LLE emulator means nothing. The point you're missing is that without LLE, it wouldn't be as accurate as it is compared to the others. Quote: The point you're missing is that without LLE, it wouldn't be as accurate as it is compared to the others. No, probably not, but not because it's impossible to make HLE as accurate. No one is arguing that hle isn't usually more accurate. It also tends to be easier to make lle accurate than hle. But hle can still be accurate. Sometimes perfectly so. Severals examples of that have already been given. shoober420 Wrote: You saying that HLE can be as accurate as LLE is making me question your knowledge on emulation. HLE will never be as accurate as LLE. If HLE will never be as accurate as LLE, then what about the points I've made so far? The GB BIOS, the DAA instruction in VBAM, the DSP-1 and DSP2-2 coprocessors, and DSP HLE audio in certain games? These are all cases were HLE matches LLE bit for bit. How is that never? shoober420 Wrote: I have demonstrated that LLE is more accurate then HLE, by pointing out that no HLE SNES emulator can render Air Strike Patrol properly. Until someone makes a HLE emulator that can render Air Strike Patrol properly, you are wrong. That's an informal fallacy, the argument from silence. It's not logical or reasonal in a rational debate to use that type of argument. That something does not yet exist has no bearing on whether it can exist at all. Example: the fact that computers never existed in the past had no bearing whatsoever that computers eventually could (and do) exist. You still haven't technically explained why it's impossible to emulate the shadow with HLE. I told you what would be valid answers (e.g. some sort of reference to the SNES hardware) and you've yet to provide even that. shoober420 Wrote: Exactly my point HLE fanboy, you can't emulate anything with 100% accuracy like you stated, even if its only the BIOS like you claimed. Although, LLE will always be more accurate then HLE. Please read for context. I'm playing devil's advocate. I'm assuming that something can't be emulated 100% accurately, as you do. If that is true, I'm questioning why you're asking me to prove a CPU or GPU can be emulated 100% under HLE when it's just as impossible under LLE. shoober420 Wrote: When I say upscaling isn't interpolation, I mean upscaling isn't interpolation. If I can use interpolation on a texture without the need to upscale it, then upscaling is not interpolation. You saying this makes you look very ignorant. Wikipedia Wrote: interpolation is a method of constructing new data points within the range of a discrete set of known data points. Upscaling is a method of constructing new data points (new pixels in its case) within a range of a discrete set of known data points (the existing pixels). What's there to argue against? Upscaling fits the definition of interpolation. Saying it doesn't is ignorant and shows a fundamental misunderstanding of both language use and mathematics. How does that prove that SNES9x is using HLE for the CPU? From that video, it's impossible to discern whether or not the issue is in fact with the CPU (as you claim), with the PPU, or any other component that affects SNES emulation (overall system timings, MMU, etc). RachelB provided you with the CPU code that actually runs on SNES9x, and you haven't proved that there is an instance of HLE there, as in no specific segments have been pinpointed (by you or by someone else). shoober420 Wrote: Because HLE is the reason there is no shadow in Air Strike Patrol. 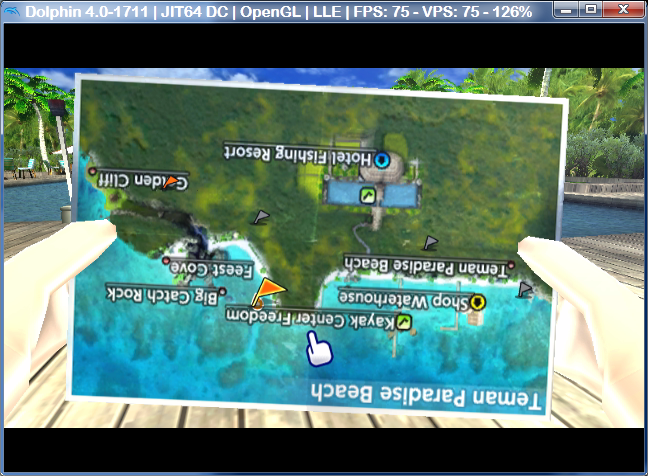 HLE is being used to emulate the PPU with other emulators, which is why there is no shadow in the first place. Again, prove it. Where exactly in the PPU emulation is high-level emulation causing the error? You have a habit of saying things, then reasoning them out with "because of HLE". That's not a complete response or explanation because there are actual reasons why HLE fails in certain instances (it doesn't read Register XYZ often enough, it doesn't update VRAM like it's supposed to, etc). You need to start providing those actual reasons, else you're just saying things online, which anyone with a keyboard can do. shoober420 Wrote: I wouldn't consider those enhancements, as much as options. There is no way a true LLE emulator can increase internal resolution, and until you or someone else does it, you are wrong. Your distinctions between enhancements and options are arbitrary at best. What makes internal resolution an enhancement, but being able to rewind gameplay, pause it at any moment, or apply scaling filters are somehow options? If there is no way for a true LLE emulator to increase the internal resolution, what are the technical limitations preventing this? Is it a limitation of 3D APIs such as OpenGL or D3D? Is it due to the fact that accounting for scaling somehow affects other parts of the rendering process, and if so which parts and how? When you emulate a 3D engine (the DS for example), you'll get a bunch of data representing 3D objects (lists of vertices to make polygons, lighting position and intensity info, texture coordinates). If you LLE this component of the DS, all that data will be as accurate as you can make it. When you display it, all you have to do is proportionately scale the coordinate data. The result will still be accurate in comparison to the real hardware; it will just look like what the real hardware would have looked like at a high resolution. I've studied this and I've done some testing as well in Desmume. shoober420 Wrote: Find a better source please. You must of had to dig pretty deep to have to find a website that claims upscaling is interpolation if its in a different language. Which makes sense, because when I googled it, I couldn't find a legit source that claimed upscaling is interpolation. When you upscale an image, it almost always uses Nearest-neighbor interpolation, not its own special interpolation method like you claim. It was the 4th result from my search. I already gave you 3 links your the other thread, and they all came from the 1st page of my search results. I've also already given you Wikipedia's definition of interpolation, which perfectly describes the behavior of upscaling. shoober420 Wrote: When you upscale an image, it almost always uses Nearest-neighbor interpolation, not its own special interpolation method like you claim. Not true. Many image editing programs (GIMP for example) let you choose between a few different interpolation methods (bicubic is one of them, off the top of my head. Many GUI APIs will render larger images with bilinear filtering by default (HTML5's canvas and GTK's GDK Pixbuf are two examples). Many HDTVs use their own methods of scaling (because nearest-neighbor is horrible for various types of content, especially movies). shoober420 Wrote: Mupen64Plus is based off of Mupen64, which is a HLE emulator. Just because an emulator uses LLE interpreters, doesn't make it a full blown LLE emulator like you claim. Don't try to change the topic. We were discussing whether or not the CPU is HLE'd, not the whole emulator. Again, the CPU looks extensively LLE'd. It's not really evidence of anything, since the same bug could potentially exist with LLE. Source code is the only possible evidence. (07-10-2013, 05:40 AM)RachelB Wrote: But hle can still be accurate. Sometimes perfectly so. Severals examples of that have already been given. Only at simple things like BIOS, even though if you LLE'd it, I bet you it would be a tad bit more accurate then HLE, since LLE will always be more accurate then HLE no matter what. (07-10-2013, 06:15 AM)Shonumi Wrote: If HLE will never be as accurate as LLE, then what about the points I've made so far? The GB BIOS, the DAA instruction in VBAM, the DSP-1 and DSP2-2 coprocessors, and DSP HLE audio in certain games? These are all cases were HLE matches LLE bit for bit. How is that never? Saying bit for bit is very misleading, and down right wrong. LLE will always emulate those things you mention more accurately then HLE, but not even LLE can emulate bit for bit, let alone HLE. (07-10-2013, 06:15 AM)Shonumi Wrote: You still haven't technically explained why it's impossible to emulate the shadow with HLE. I told you what would be valid answers (e.g. some sort of reference to the SNES hardware) and you've yet to provide even that. HLE uses shortcuts, which is why the shadow goes missing. Shonumi Wrote: If that is true, I'm questioning why you're asking me to prove a CPU or GPU can be emulated 100% under HLE when it's just as impossible under LLE. It was a satirical question, because nothing can be emulated with 100% accuracy. Maybe 90% at the most, but emulation can't 100% replicate original hardware, no matter how hard you try. Although I would say the BIOS is replicated 99%, not 100%. Nothing can be emulation with 100% accuracy. Its emulation after, not replication. It will never be 100% accurate. Shonumi Wrote: Upscaling is a method of constructing new data points (new pixels in its case) within a range of a discrete set of known data points (the existing pixels). What's there to argue against? Upscaling fits the definition of interpolation. Saying it doesn't is ignorant and shows a fundamental misunderstanding of both language use and mathematics. Wikipedia Wrote: A video scaler is a device for converting video signals from one size or resolution to another: usually "upscaling" or "upconverting" a video signal from a low resolution (e.g. standard definition) to one of higher resolution (e.g. high definition television). That is the real definition of upscaling. Upscaling just uses interpolation to resize the resolution. Remember, just because something uses something else, doesn't make it what it uses. Shonumi Wrote: How does that prove that SNES9x is using HLE for the CPU? From that video, it's impossible to discern whether or not the issue is in fact with the CPU (as you claim), with the PPU, or any other component that affects SNES emulation (overall system timings, MMU, etc). RachelB provided you with the CPU code that actually runs on SNES9x, and you haven't proved that there is an instance of HLE there, as in no specific segments have been pinpointed (by you or by someone else). SNES9x is a HLE emulator, if you don't know that, or disagree with it, you have a lot to learn, or are just very stubborn. No one would mislabel SNES9x like that in a video. Its a common fact that SNES9x is HLE. Shonumi Wrote: Again, prove it. Where exactly in the PPU emulation is high-level emulation causing the error? You have a habit of saying things, then reasoning them out with "because of HLE". That's not a complete response or explanation because there are actual reasons why HLE fails in certain instances (it doesn't read Register XYZ often enough, it doesn't update VRAM like it's supposed to, etc). You need to start providing those actual reasons, else you're just saying things online, which anyone with a keyboard can do. You're a hypocrite, because you can't show it yourself. You just copy and paste code to a non-programmer and expect him to be able to find it. Since you are the programmer, you should easily be able to show proof that HLE isn't being used on the PPU. All SNES emulators prior to bsnes/higan couldn't emulate Air Strike Patrol correctly, and since bsnes/higan uses LLE, is that just a coincidence that its because of LLE? I don't think so. The reason it emulates correctly is because of LLE, something all the other emulators prior to bsnes/higan didn't implement on the CPU. Shonumi Wrote: When you emulate a 3D engine (the DS for example), you'll get a bunch of data representing 3D objects (lists of vertices to make polygons, lighting position and intensity info, texture coordinates). If you LLE this component of the DS, all that data will be as accurate as you can make it. When you display it, all you have to do is proportionately scale the coordinate data. The result will still be accurate in comparison to the real hardware; it will just look like what the real hardware would have looked like at a high resolution. I've studied this and I've done some testing as well in Desmume. Talk is cheap. Until you are able to create the very first true LLE emulator to increase internal resolution, you have no say and are wrong. Shonumi Wrote: Not true. Many image editing programs (GIMP for example) let you choose between a few different interpolation methods (bicubic is one of them, off the top of my head. Many GUI APIs will render larger images with bilinear filtering by default (HTML5's canvas and GTK's GDK Pixbuf are two examples). Many HDTVs use their own methods of scaling (because nearest-neighbor is horrible for various types of content, especially movies). Shonumi Wrote: Don't try to change the topic. We were discussing whether or not the CPU is HLE'd, not the whole emulator. Again, the CPU looks extensively LLE'd. Oh that's very on topic bro. If the CPU uses an LLE interpreter, but the emulator itself is HLE, it still uses HLE on the CPU in some form, making it not a true LLE CPU emulator (unlike MESS which is). (07-10-2013, 09:24 AM)RachelB Wrote: It's not really evidence of anything, since the same bug could potentially exist with LLE. Source code is the only possible evidence. It goes to show that SNES9x does indeed use HLE instead of LLE which higan uses. I took this quote from this article. Article Wrote: Snes9X uses highly refined high level emulation to great accuracy with only a fraction of the processing power required, not to mention it’s surperior save-state system. LLE won't always emulate things more accurately. There can be bugs in LLE emulators just as there can be in HLE emulators. He's only saying that in those examples the HLE emulators match the LLE emulators in accuracy. I know you don't keep up with stuff here, but he literally coded his own gameboy emulator. In this sense he actually knows every detail on the subject. He's saying how does that video prove it. I did a google search and yes. You are right, Snez9x uses HLE. Big whoop. Do you realize that the emulators were created with different goals in mind? Snes9x was created to be able to play snes games on low end systems. Where as the creator of bsnes wanted it to be as accurate as possible. Different goals man. Quote: Wikipedia Wrote:A video scaler is a device for converting video signals from one size or resolution to another: usually "upscaling" or "upconverting" a video signal from a low resolution (e.g. standard definition) to one of higher resolution (e.g. high definition television). Quote: That is the real definition of upscaling. Upscaling just uses interpolation to resize the resolution. Remember, just because something uses something else, doesn't make it what it uses. He's saying the definition fits, read every word please. Going off of your definition and his, it does fit. I got this far and just gave up. With your post/logic there's no need for me to even try explaining anything else. You truly are a dense person. What you say is what you think is absolutely right. Even with all of the members on this forum, who almost all program, you still don't believe them. NatrualViolence is basically the forums local tech expert and a computer science major, Shonumi has programmed on the gecko emulator(another gamecube emulator) and even coded his own gameboy emulator. Rachelb is a current dolphin emulator developer, but forget all those coding backgrounds. You're totally correct on everything you've said. Seriously, why do all of your topics end with you arguing with people? Can you not accept that you aren't right about everything or what? Please start replying more mature. The forum as a whole would appreciate it. What's the point of this discussion? Both LLE and HLE will find their uses depending on a given platform. See mednafen's psx core thats low-level and uses software rendering while being relatively easy on resources(2.0 GHz dual core required) vs current n64 approaches that won't reach playable speeds on current gen CPUs. F S M I believe.